Many years ago I was at home on a bitterly cold winter evening and was feeling very alone. I started to cry and called out to the angels. Then, I heard a bird begin to sing outside my bedroom window. I knew it was telling me, "You are not alone. All will be well." Birds can be used as messengers from angels and other higher-dimensional beings. The birds that are used to send messages will be different for everyone. When I see a hawk or falcon I know that I should pay attention to the small details around me, for they will have meaning. These majestic birds often fly over my house when I am engaged in an intuitive healing session. Crows have also played an important role for me. They appear in my personal journeying during altered states of awareness, and they are regular visitors to my home. In fact, as the moving truck drove into my new home, a line of crows flew to the trees surrounding it and watched all of the commotion. They then came back every day for the first week to both greet me and take the measure of me. They are smart creatures. Some people tend to have more bird messengers than others. It all depends on the person, his or her energy, and to what elements the person is aligned. People who have a lot of air signs in their astrological chart tend to get our winged friends sent to them. Alonya, my personal angel helper, calls people with a lot of air signs "intellectually centered," meaning they tend to be in the mental body rather than the emotional or physical body. I have worked for years communicating with animals that work as spirit guides for humans. Each animal spirit has a distinct message for each person. Because of this, books on the subject of animal communication should be used more as tools than a one-size-fits-all message. The information in the books cannot take the place of connecting with the animal spirit on your own to find out what message it has for you. I connected with the robin that guides me, and he told me that all robins tend to bring teaching and a message of affection and family. They are intelligent, hardworking, and watchful. They teach us to be loved and also remind us to have fun in our daily life. A robin's message usually has something to do with retaining our identity and the sweetness of life in the midst of family life and careers. If you have experienced a visitation by a robin, spend some time connecting with that bird. You can do this silently or out loud, even if the bird isn't in your field of vision. You can honor it for being a messenger. Donate to organizations that help robins and other birds, such as bird sanctuaries and wildlife rehabilitators. 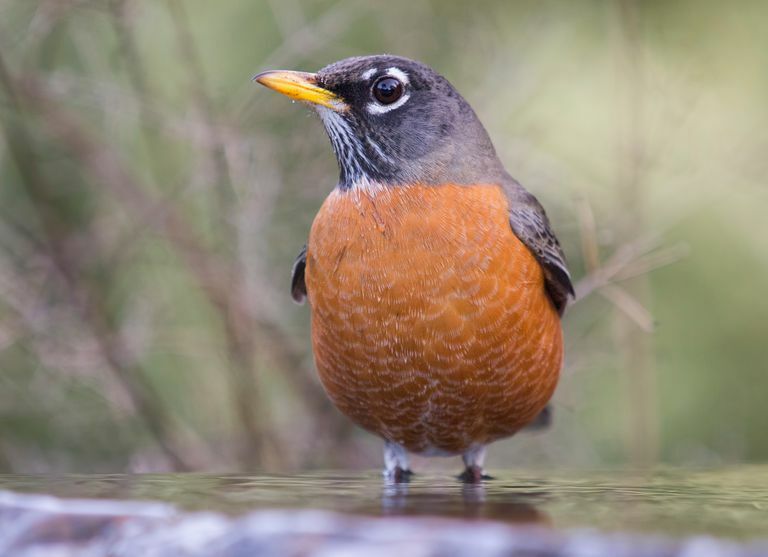 If you have overwintering robins, put out fruits such as apple slices, raisins, or fresh or frozen berries for it to eat. All of these activities serve to acknowledge everything the birds help us with and make the connection to them stronger. A little robin, with its quirks, is a messenger sent by the divine and the angels to remind you that you are not alone. Even when inside you are not alone. A robin looks for a mate to create a family. Robins leave their home to migrate, and they gather together as a community when food is scarce. They have to go out into that big world, and it takes all their strength to do so. Every year they come back to the place they are born and create a home and family. Amazing, isn't it? Your robin brings the message of strength. It reminds you to never give up and that you are strong. Have faith in your strength and in your future. Your robin is here to teach you that it may not seem so quite yet, but the world is a safe place for you.